Kentucky came into Tuesday night’s matchup with Western Kentucky after being swept by Missouri at home over the weekend. Early in March, Kentucky was a team with as much momentum as any team in the country. They entered last weekend’s series with Missouri on a twelve-game win streak that included a sweep of #11 South Carolina in Columbia and almost eight runs per game on average. Four of those twelve wins went just five innings and the team was allowing just over two runs per game. The Wildcats carried that momentum into the first four innings of their game on Friday, scoring eight runs to Mizzou’s four. Abbey Cheek was even robbed of a three-run home run in the bottom of the second inning that would have given Kentucky an even larger lead. However, Kentucky’s momentum flipped in the top of the fifth. Mizzou reached base seven times in a row with two outs in the top of the fifth to tie the game at 8-8. The Tigers added two more runs in the top of the eighth to secure the 10-8 victory in extra innings, handing UK its first loss since February 23rd to #1 UCLA. Mizzou took the next two games as well despite Abbey Cheek breaking the UK career home run record at Kentucky in game two. Cheek hit her record-breaking 49th career homer on Saturday and added her 50th in the third game on Sunday. Cheek’s record breaking performance wasn’t enough to avoid a series sweep. Not only were the losses uncharacteristic for a Kentucky team who had been unstoppable in March, but the team committed their first two errors in SEC play in Sunday’s loss. That loss marked the first time UK had been swept at home since 2017. 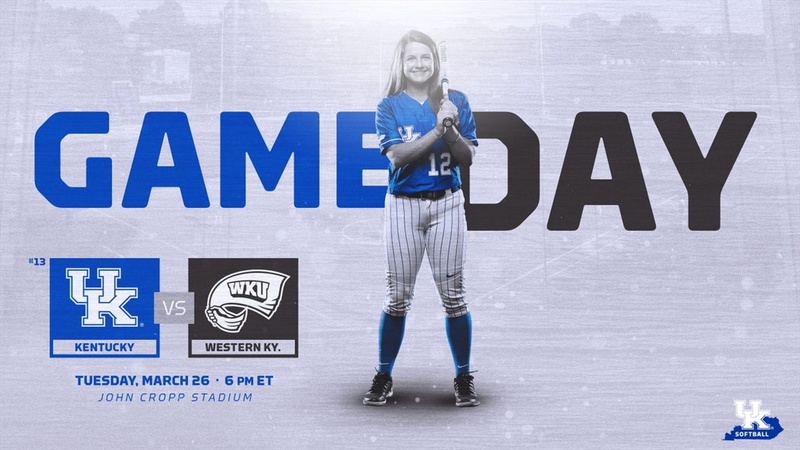 Tonight, Kentucky’s pitching dominated Western Kentucky for six innings on Tuesday but a three-hit, four-run inning proved too much for the dormant Kentucky offense to overcome. Western only mustered one hit outside of their fifth inning rally, but that rally was all they needed with Kentucky unable to score. After getting the first two outs of the inning, Autumn Humes allowed back-to-back solo home runs before being pulled from the game. Grace Baalman replaced her and allowed a two-run blast to push Western up 4-1. Kentucky was unable to mount a comeback. Kentucky’s only run came on a Mallory Peyton solo home run in the bottom of the fourth, her eighth on the year in just 103 plate appearances. Kentucky was slated to play Ohio State but the game was postponed so they will have to wait until Friday to turn their luck around. Kentucky goes on the road to Fayetteville, Arkansas, looking to finish March like they started it - winning. Arkansas is 23-10 on the season and is ranked 13th in the USA Today Coaches Poll. The Razorbacks will be looking to improve on their underwhelming 4-5 record in the SEC. Friday night’s game will start at 7:00 PM ET, followed by 2:00 PM games on Saturday and Sunday.